I assume that you already have a BPI Express online mobile banking account while you’re reading this post. In case you haven’t created yet an account yet just visit their website then enrol your ATM card. 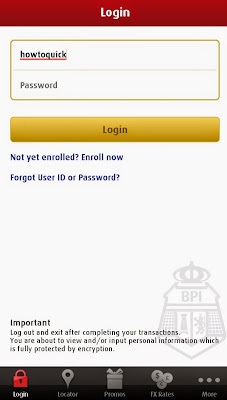 BPI mobile app is available on most widely used platform like Android, iOS, Blackberry and hopefully in Windows Phone soon. You can easily download the app for free on your respective mobile OS app store. Just type ‘BPI’ on the search box then the app will appear on your search results, look for BPI only app name then install. Now let’s start using cool feature of BPI where you can transfer money to anyone, to your own and to third party. This will ask you to input the JAI (Joint Account Indicator) and device alias or name. This JAI refers to the number on the lower right of your ATM card. In my case it’s a 2 digit number. 4. You’re almost done, the next thing you’re looking for is the activation code. 5. To get the activation code you need to follow few simple steps indicated on the email sent to you from Express Mobile. 1.Insert ATM Card of enrolled account. 4. Once done, display message will appear on ATM machine telling you that EOL transfer to anyone has been enabled. Note: Do this steps within 5 banking days. 6. To get the activation code, open your email account you used in enrolling BPI. You’ll receive the code in there. In my case it takes almost 24 hours to receive the message from BPI Express Mobile. That’s it guys, once you get the code just key it in and you can now start the fund transfer to anyone feature from BPI. 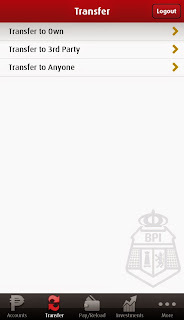 In case you want to disable or deactive BPI mobile fund transfer to anyone, just to to More then tap on 'Disable Transfer to Anyone' then tap on 'Deactivate'. I dont know the JAI number of the account i was transfering money. What would i do? I want switch mobile phone and I cannot activate the transfer to anyone feature on my new phone. What will I do?